In order to make sure that the peso bills citizens are being given as change are not fake, a netizen shared tips online. Netizen Joy Mortola's tips were shared by Facebook page Unofficial: dammit, in relation to recent reports of fake peso bills scattering nationwide. Here are 4 quick tips to detect fake Philippine money as you get it, according to Mortola. The first one is to touch the money. According to Mortola, one easy way to detect fake Philippine bill is to run your fingers through it. Because real money is made of cotton and Abaca, it should be somewhat rough with ridges as opposed to the fake money made of smooth paper. The images should also be raised. The texts, such a “Republika ng Pilipinas” on the top portion, the amount in words at the bottom, and the amount in figures are embossed. She said, the second tip is to look for the watermark. 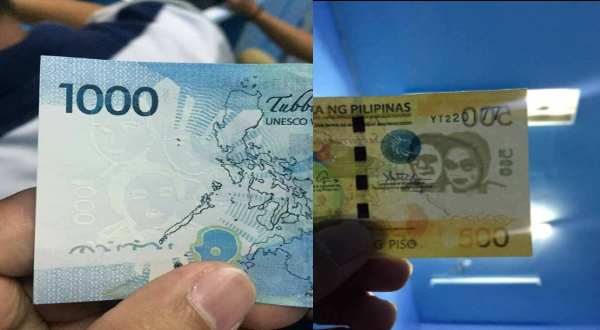 "The blank white area on the front part of all Philippine bills have watermark that match the image on the left. You can see the watermark by putting the money against the light and tilting it a bit. The image of the bill, as well as the denomination can be seen on the right side." It is essential that one be active in checking these signs immediately after money has been handed to them to check and invalidate it to its giver instantly, before such leaves one's sight. All Philippine notes have embedded security thread. The threads of the 20 and 50-Peso bills are 2mm wide, while the 100, 200, 500, and 1000-peso bills are 4mm wide. The 4mm security threads appear stitch-like and metallic that also change in color depending on the angle. The last tip according to Mortola, is to look for the OVD (Optically Variable Device) patches for 500 and 1000-Peso Bills. "The 500 and the 1000-peso bills have reflective round patches on the left front side of the bill. These patches change their color when rotated. In these patches, you will see a small BSP (Bangko Sentral ng Pilipinas) logo for each denomination with a Blue-naped Parrot for the 500 bills and South-sea pearl for the 1000 bills," Mortola said. The Facebook page also added pictures of the fake bills, as reference for netizens.